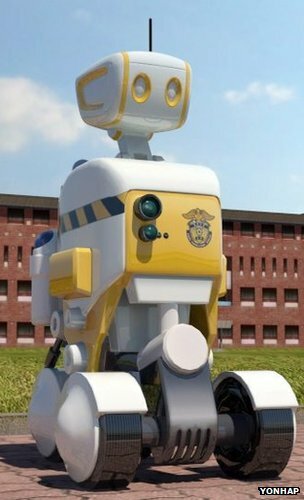 Robot wardens are about to join the ranks of South Korea’s prison service. A jail in the eastern city of Pohang plans to run a month-long trial with three of the automatons in March. The machines will monitor inmates for abnormal behaviour. Researchers say they will help reduce the workload for other guards. South Korea aims to be a world leaders in robotics. Business leaders believe the field has the potential to become a major export industry. The three 5ft-high (1.5m) robots involved in the prison trial have been developed by the Asian Forum for Corrections, a South Korean group of researchers who specialise in criminality and prison policies. It said the robots move on four wheels and are equipped with cameras and other sensors that allow them to detect risky behaviour such as violence and suicide. Prof Lee Baik-Chu, of Kyonggi University, who led the design process, said the robots would alert human guards if they discovered a problem. “As we’re almost done with creating its key operating system, we are now working on refining its details to make it look more friendly to inmates,” the professor told the Yonhap news agency. The one-month trial will cost 1bn won (£554,000) and is being sponsored by the South Korean government. It is the latest in a series of investments made by the state to develop its robotics industry. The country’s Ministry of Knowledge Economy said in January that it had spent the equivalent of £415m on research in the sector between 2002 and 2010. It said the aim was to compete with other countries, such as Japan, which are also exploring the industry’s potential. In October the ministry said the Korean robot market had recorded 75% growth over the past two years and was now worth about £1bn. Success stories reported by the Korean media include Samsung Techwin’s sale of a robotic surveillance system to Algeria and shipments of the humanoid Hubo robot to six universities in the US. Within the country English-speaking robotic teaching assistants are already being deployed in some schools to help children to practise their pronunciation. The Joongang Daily newspaper reported in August that a company called Showbo had begun mass producing a robot that bowed to shop customers and told them about promotions on offer. Other firms say they hope to start selling robots to help care for the elderly before the end of the decade, and personal assistant robots further down the line. The government is also building a Robot Land theme park in the north-west city of Incheon to help highlight the country’s success. Planners say they hope 2.8 million people will visit each year. This entry was posted in AI Robotics, Big Brother Surveillance Society. Bookmark the permalink.